Over the past decade the brokerage industry has changed significantly. You can buy and sell practically any security online. Even still, people often insist on paying a broker hundreds of dollars to do it for them. Personally managing your investment portfolio is not for everyone, but for the plurality of investors, that challenge and opportunity is real and very rewarding. For some additional guidance, and for those so visually inclined, I want to break down the infographic below. It should make it easy for you to decide what kind of broker is for you: online, discount, or full-service. This is my personal preference. I consider myself a “mid-term” trader. I want to do tons of research, look at daily, weekly and yearly charts and analyze them. Constantly searching for stories and what people are saying is imperative to me. I do know, inside of these parameters, that I’m responsible for my own portfolio if I blunder. If I fail, I have to own it and can’t blame anyone else. Some people may find this frightening. But at the very least you know that your money manager won’t be swindling you and high-tailing it away with your hard earned cash! The “What Kind of Broker Should I Use?” Infographic makes it seem like you’re completely on your own should you choose the Online option. That’s not entirely true. Most online brokerage firms are glad to assist if you run into any stumbling blocks, need technical support, or have questions. However, there are some with no live support at all. The distinction between Online and Discount has become blurred over the last few years. Industry competition has forced online firms to offer support and even investment education while discount firms have lowered their commissions to compete with the online brokers. Full-service firms have even absorbed smaller companies to offer competing services. For example, if you search “discount brokers”, the top three results you’re likely to receive are Scottrade, Fidelity and TD Ameritrade. These three firms all offer low costs, in-office training and seminars, portfolio management, and online trading. As I see it, full service brokerage firms are for three kinds of people – those lacking the time necessary to do the diligence in order to make correct investment decisions, others that can afford to pay someone else to do it for them, and those that are on an utter losing streak and can’t find a win to save their life. If you’re like me, you don’t have a full-time job in the financial sector. That makes it hard to keep pace with the professionals, and to put in the time required to be a current and knowledgeable investor. Not many people want to come home and sit in front of a computer to conduct stock research when they’ve already been staring at a screen all day. Although I think investing and trading is an intriguing venture, if I was sitting on a few million dollars I would gladly pay someone else to invest for me while I started my own non-profit and spent as much time with family as possible. Even if you plan on holding a security for a months and perhaps years, it safeguards you to have someone else keep an eye on your assets. Finally, individuals that have tried investing on their own only to lose money from the majority of their investments are better off hiring someone to do it for them. I feel really bad for the people that seem to consistently buy at the top and sell at the bottom no matter what kind of strategy their using. Sure, you’re going to pay around 1% of your total portfolio value if you pick a fee-based advisor, but a 1% fee coupled with an 8% gain is better than no management fee and a 10% loss. 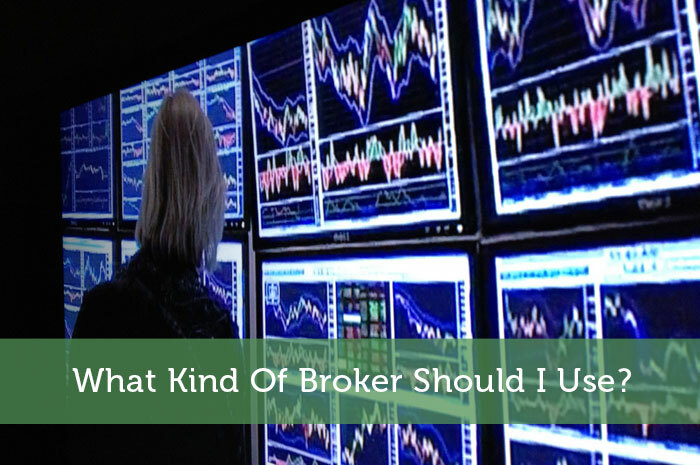 READERS: What kind of broker do you use? Which do you prefer and why? I also think online brokers are the best to use these days with all the technological advances that has happen. By the way, that’s a very nice infographic there. Thanks Mark. I wasn’t originally planning on using it, but it happened to fit with exactly where we were going with the article. Mint.com has popped out a couple good ones. I agree that for a personal investor in 2013, online brokers is the best choice hands down. And shop around, as the fees per transaction vary hugely for what is essentially the same service. I agree with that. Aside from the included broker-assisted fee, if you aren’t going to use that and you’re a high volume trader/investor, then going with the lowest commissions is a smart option. Online brokers are the way to go! I’m currently with Betterment and looking at some others to diversify with! Thanks for the great read! Thanks Josh–how do you like Betterment? I’ve tried TD, E*Trade and Options House. I like TD’s software the best, but the learning curve was steeper. E*Trade is solid, but Options House had the best rates (and they aren’t just for options). I haven’t gotten into investing but I will be doing so. I definitely plan on using an online broker. It just seems more convenient to me. This is great information. An online broker is convenient, but you’ll definitely want someone to be your guide as you first dive into stock investing. Make sure to consider real estate and many, many other forms of investing as well! (Oil, gold, commodities, bank notes, etc). I use Vanguard for my ROTH and Tradeking for my individual stock picks. I guess I don’t know the difference between online and discount. I just know I can’t afford for full service. Is Vanguard something you use through your employer or did you decide upon them on your own? My mom ended up with a full service broker and she doesn’t have that much money but they guy does know what he’s doing so it works for her. I’m a huge Vanguard fan and in a couple of weeks I want to open a Roth with them. If a person feels most comfortable meeting with a person and getting coached through exactly what they want, I think a “live” broker certainly is the way to go. I have only used online brokerage services and don’t know why I would seek anything else. I’ve been pretty happy, but if I struck it rich, maybe I’d need a live person to help me? Honestly, I’d probably keep doing what I am now, just with more money. I have wondering if I struck it rich, would I use a human? But if they are so great of a broker, why are they being a broker? I definitely fall into the camp that most investors are better off personally managing their own portfolio. The most significant reasons are to minimize fees (which can negatively impact a portfolio) and by managing their own portfolio, savvy investors are more likely to educate themselves and stay engaged with their portfolio, which is required for long-term success. It’s 2013… everyone should be using online brokers to save themselves hundreds of dollars a year on transactions. I prefer ThinkOrSwim through TDAmeritrade. They have the best charting software around!